The Transition Year is an optional one year educational programme for students who have completed the Junior Certificate. It offers students a wide range of learning experiences aimed at contributing to personal development, social awareness, and work-related learning. The Transition Year Programme promotes the personal, social, vocational and educational development of students and prepares them for their role as autonomous, participative and responsible members of society. 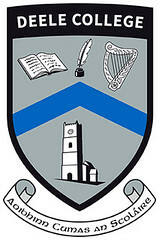 The Transition Year Programme in Deele College is a optional year. It helps pupils make the transition from Junior Cycle to Senior Cycle as effectively as possible. At national and at local level, research shows that this additional year can and does make a difference. It is reported nationally that those who complete the additional year do better in the Points System. It is our experience in Deele College that the maturity that comes with the additional year does, in fact, make a positive difference in examination results. The extra year is an investment in the pupil’s future. A focus in Careers during the year helps students to investigate their future and determine the goals needed to secure their future. Students do four weeks of Work Experience during the year to give them an insight into the world of work. Modular subjects such as Music, Art, Construction Studies, Design Communication Graphics, Physics and Agricultural Science are studied in blocks. The students cover the ECDL programme and Safe Food programme and complete the exams online. Guest speakers and activities are arranged during the year including outdoor pursuits, Gaisce Awards, BT Young Scientist Exhibition, Junk Koutour, AIB Build A Bank Challenge, First Aid, Craft Fair, Coaching course, Song school and mentoring by Donegal Enterprise Board.